Differentiating your product and brand in a crowded landscape of similar offerings is challenging to say the least. Whether your printed piece is a folding carton, catalog, decal, or pressure-sensitive label, adding a coating to the surface not only can protect the piece but can also add stunning visual and tactile effects. Unique finishing effects are incredibly effective and powerful in motivating consumer behavior. Not only do they differentiate a product, but they communicate with the consumer about your image and brand. The visual effect may capture the customer, but the tactile effect can reel them in and influence the ultimate purchase. Print coatings can be used on paper, board, and non-paper substrates, and they come in a variety of options like gloss, dull, pearlescent, soft touch, glitter, dry erase, raised, and textured to name a few. You also have the option of coating your entire piece, applying a coating to specific areas, or combining multiple coatings for an even more dramatic effect. Varnish is simply a clear ink that is applied in-line like any other ink; it can be tinted to create a special effect. Varnishes can be glossy, satin, or dull and can be applied to the entire piece or to specific areas, such as photographs or graphic elements, for special effects that engage your customer. Aqueous coating is a clear, water-based coating that is applied via a rubber blanket during the in-line printing process. Typically, an aqueous coating is applied to the entire piece as a “flood coating.” With aqueous coatings, you can select from gloss, satin, dull, or soft touch. UV coatings are cured by exposure to ultraviolet light, and they dry quickly on a printed surface for a fast turnaround time. UV coatings can be glossy, satin, or dull. UV gloss coatings are generally much shinier than aqueous or varnishes. 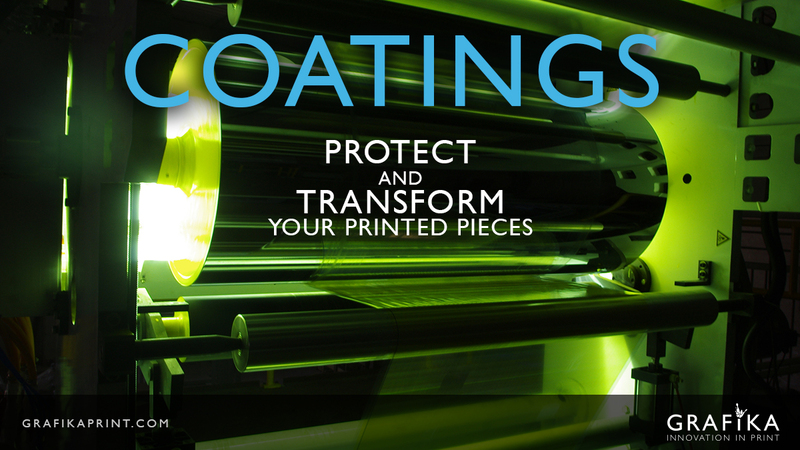 UV coatings can also be done in-line on UV printing presses or off-line for added visual effects. Silkscreen coatings are applied off-line on a silkscreen press. Silkscreen coatings come in a wide variety of colors and textures, allowing us to create a multitude of print effects like glitter, glow, textures, and scents. They can also be applied to various substrates that include paper, board, and synthetic materials. At Grafika, we offer these and many other coating options in-house. We will work with you to come up with the best and most affordable coating to enhance any printed piece. Call us today to learn more about how coatings can make your items shine! We’re happy to share samples of a variety of coatings and techniques plus our ideas for transforming your materials.